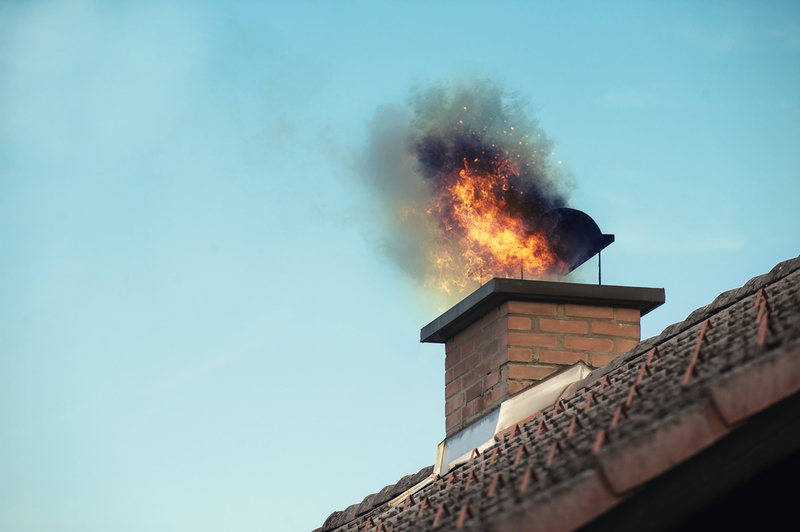 Chimney fires are caused by the combustion of a build up of deposits within a flue. These deposits can be caused by tar and creosote from the flue gasses cooling within the flue, or through debris being dropped into the flue by nesting birds. What happens during a Chimney Fire? The deposits within the flue can be ignited either by a spark or ember travelling up into the flue, or if an appliance is used at too high a temperature. Once the deposits are ignited they will start to burn and often sparks and flames can be seen exiting the top of the chimney. A chimney fire can take hold very quickly. Sparks can scatter from the top of the chimney or through cracks in the flue and ignite the roof, roof timbers or other parts of the property. Nearby properties and any trees that are close by are also at risk. These are some of the signs to look out for. However, it is also possible to have a fire inside your chimney or flue without seeing any signs at all. The unnoticed chimney fire can still cause substantial amounts of damage though. Of the risks listed above, trying to keep your woodburning stove running overnight by smoulding wood or other fuels at low temperatures is the most damaging to your chimney or flue and runs a great risk of causing a chimney fire. The critical elements for combustion are oxygen, heat and fuel. If you reduce the oxygen supply and the heat in your stove, as a result not everything will be burnt. 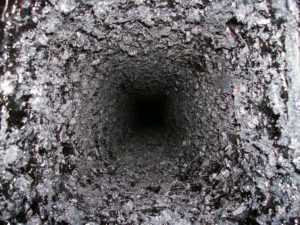 The unburnt, combustible materials – such as tar, creosote and paraffin will pass into the flue and then stick to the liner with the potential to ignite at a later date. This will happen irrespective of how well seasoned your wood is. On top of that, tar that sticks to the side of the flue is impossible to completely remove – it has similar properties to tar that is used for surfacing roads. 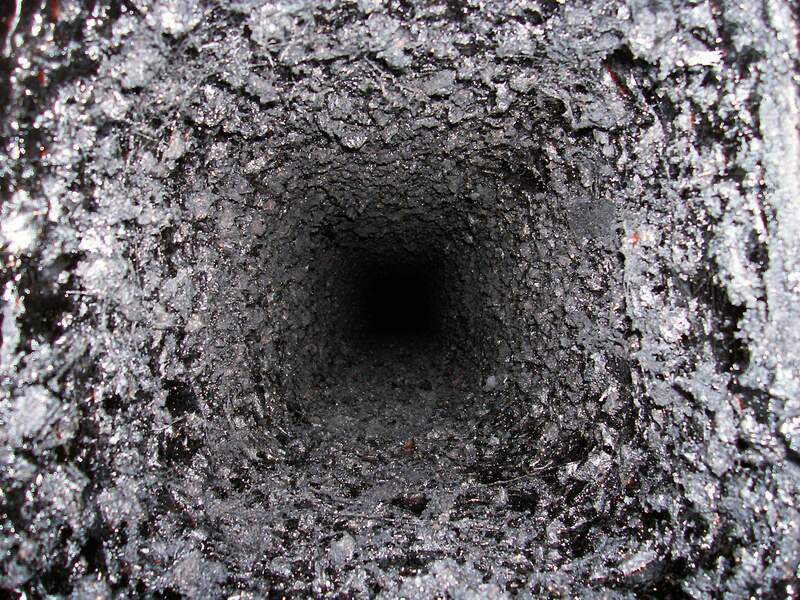 The picture shows the inside of a flue covered in tar, creosote and other deposits. Always thoroughly read the stove manufacturers handbook or guidelines for use. Also, bear in mind that a manufacturer may state that it is possible to run a stove at a very low temperature to keep it burning overnight because the appliance is capable of doing so. However, the stove manufacturer probably hasn’t considered the negative impact of doing this on your chimney or flue, as this method of using a wood burning stove can increase the risk of a chimney fire. Use a qualified chimney sweep. Contact NACS, the National Association of Chimney Sweeps for details of experienced sweeps in your area. Choose the correct sized stove or other appliance for your room. An over-sized stove won’t be able to burn all of the fuel contained in the wood. The unburnt material will pass into your chimney or flue and could ignite. Only burn well-seasoned wood that has a moisture content of less than 20%. Moisture meters are available that can test for this. What damage do Chimney Fires cause? Chimney Fires can have devastating consequences. If the fire breaches the flue it can quickly spread to the rest of the property. Even if the fire is contained within the flue, temperatures can reach in excess of 1000°C and as a result structural damage to any flue or liner is common. A chimney fire can burn hot enough to crack the walls of a chimney and can also cause damage to chimney pots and cowls. Manufacturers advise that a stainless steel flue should always be replaced after any chimney fire. As a result of the thermal shock any flue and liner can crack and become unsafe and it should be checked by an experienced chimney professional after any fire to ensure it is still safe to use. Furthermore, if smoke can be smelt within the property during a chimney fire, this is an indication that the flue has been breached and is unsafe to re-use. If at any time you suspect you are having a chimney fire you should immediately call the Fire Brigade. Even if you feel the fire has gone out, it could still re-ignite and the flue should be checked for any hot spots. If you think that you may have had a chimney fire in your property it is important to get the chimney or flue inspected by an experienced chimney professional before using it again. Finally, always use experienced chimney professionals to install your appliance and flue liner and following installation, always use your appliance and flue as per their recommended guidelines.